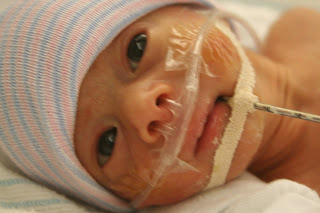 Yesterday we met with the surgeon regarding Noah. 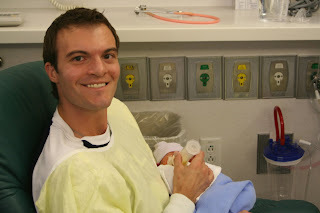 He told us that Noah had not passed his meconium plug yet, so basically he has been constipated. 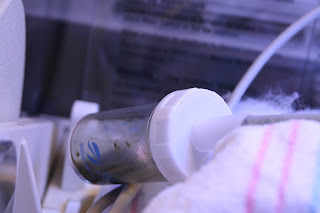 He also has area higher up in his small intestine that is narrowed, but the surgeon hopes that this will "decompress" now that he has passed his meconium plug after the enema. He still has the green bile stuff coming out of his stomach, which we are praying will become more clear indicating that his intestines have decompressed. He passed a bunch of yucky stuff this morning so we are thinking that things must be moving through the intestines, but we'll have to wait for this morning's Xray to know if that is case. So, basically, we are waiting for their decision. They have him scheduled for surgery at 5pm today (9/4/07) just in case they decide to do surgery. 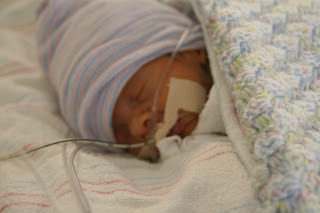 Brave Noah - Still basking in the "Sunlight"
Cohen is holding his temp well and eating 1 oz of food now. They are considering moving him to a crib soon. Finn is also getting much stronger. He is an isolette right next to little sister. 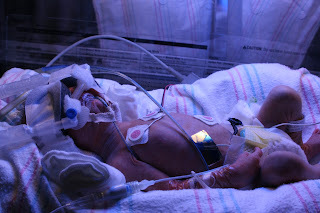 He is trying to maintain his body temp as well and so far is doing great. It is so amazing what God and these little ones can do overnight! We will update later today on what the plan is for Noah. Keep up the prayers - God hears them all. So glad my kiddos are on a recess break with another teacher because I have been waitiing for your update on Noah. Jeremiah 29:11 comes to mind, for surely God is already showing you His plans in action. Wow, Sophia is already beautiful! The babies have come so very far in 6 days! Think where there will be in 6 more days just 12 days after birth! !